As I mentioned in my last post – with no surgeries scheduled due to Easter week (Semana Santa), we returned to Cartagena Thursday evening. For those of you who are unfamiliar with the custom, Semana Santa is a big deal here in Colombia. People from Bogotá and other cities escape to Cartagena and the coast areas to celebrate and join in the parades and processions. The city is already packed with tourists – enjoying the historic quarter, and the beaches. The tour buses are full and blaring loud music for laughing visitors. Clubs and restaurants are full to bursting and swimsuit clad vacationers wander the streets along side Cartageneros. For my roommate, Iris and I – it’s a great chance to enjoy a leisurely Saturday. We headed down to the old quarter to do some shopping. 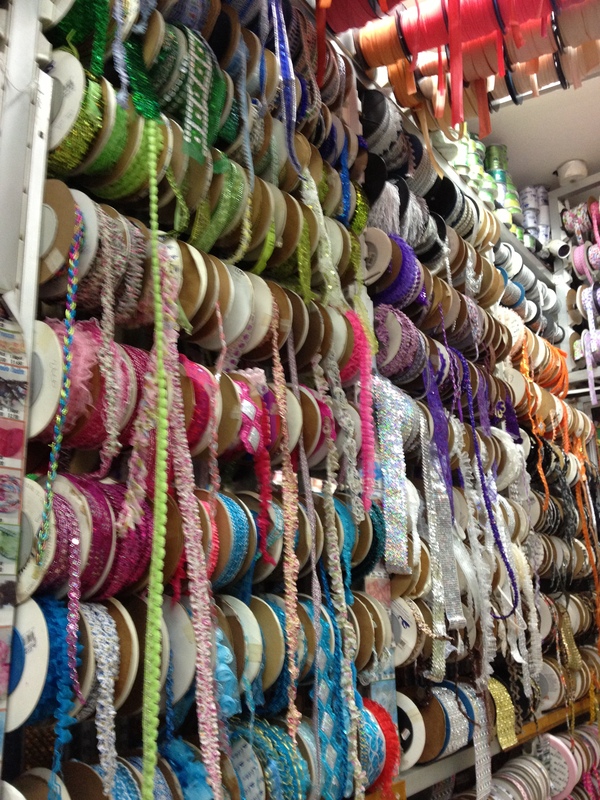 But instead of chotskies, tacky knickknacks or random souvenirs, we have a special mission in mind: Fabric shopping! One of the things I love about El Centro is the abundance of stores devoted to fashion, sewing and clothing design. There are stores filled with ribbons, lace and buttons; stores just for knitting and crochet with thousands of yards, threads and other accessories in a rainbow of colors.. Stores filled with sequins, beads and pattern magazines. Then there are the fabric stores – all clustered within several blocks. The richness of the fabrics displayed in the windows draws you in: elaborate laces, rich, silky satins, shimmering sequins and super-stretchy spandex. There stores are different from the United States – where crafting and quilting have dominated and shunted fashion sewing to the side. Instead of a huge assortment of quilting cotton, a large array of home decorator fabrics and a miniscule array of fabrics for clothing – here – fashion is king! There are meters and meters of silky jerseys, swimsuit fabrics, lighter than air sheers, wrinkle-resistant polyester blends and traditional hot weather favorites like linen. I am in heaven – and I’ve only just entered the first shop. The next great surprise is the pattern department. It’s not in the fabric stores – it’s at the bookstore or magazine stand. Bianca, Quili and other brands offer the latest in fashionable attire in handy magazines. Each magazine contains paper patterns for 10 to 40 different pieces of clothing – and each costs 9,050 (COP) or less than five dollars. I am like a kid in a candy store – and I can’t resist buying a small handful of glossy magazines. 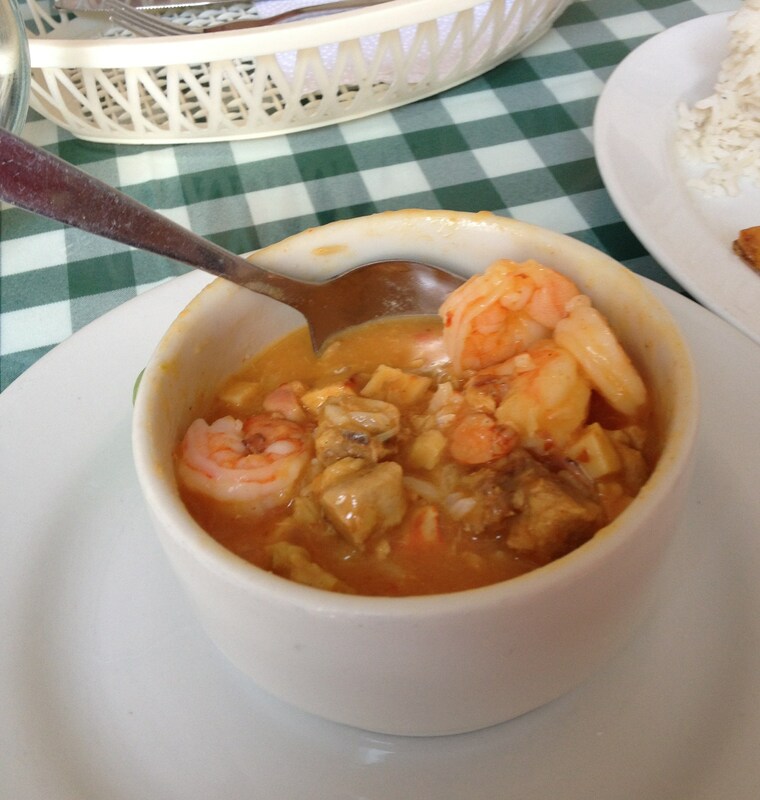 But before we go home, we head to the Getsemani neighborhood just outside El Centro – to a small local restaurant specializing in seafood called “A Casa del Buen Marisco“. It’s down the street from a much more expensive place, Antilles de Mar, but has its own reputation for excellence among the locals. I had the house favorite, the seafood soup and it was delicious. I snuck glances at fellow diners plates – and everything that came out of the kitchen looked pretty savory. After a terrific lunch – it was time to return home for an afternoon siesta. 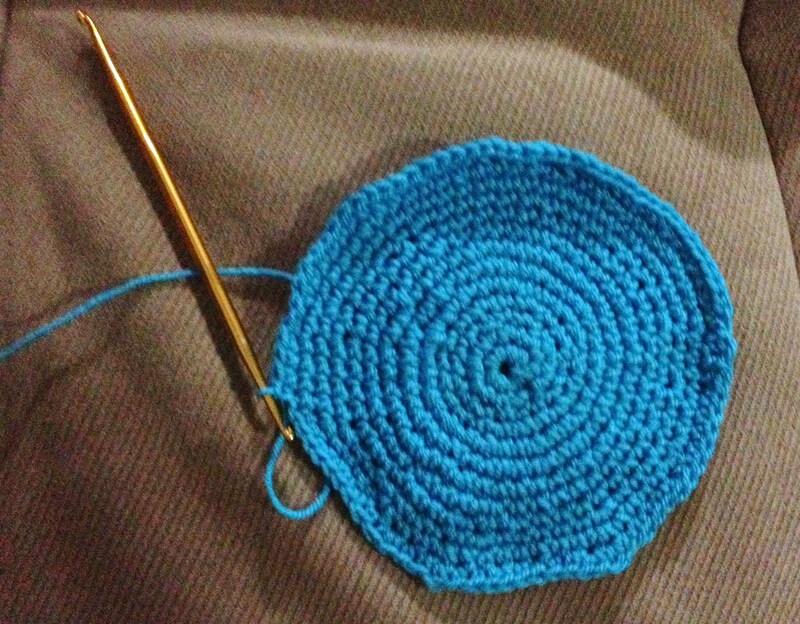 Once the afternoon cooled off, we slipped out to get Dr. Barbosa a surprise gift before returning to work on my evening project: Learning to crochet. (Don’t worry readers – Dr. B doesn’t read the blog so it’s still a surprise). As I mentioned before, Iris is teaching me to crochet a traditional Colombian style handbag. She’s been taking classes for months and recently received her certification from a specialized government agency. The Colombian government has a division that certifies artists who make authentic style Colombian goods. The government offers classes to teach people how to make these crafts (or cuisine) in the time-honored way. These free classes offer (predominately) women with a way to supplement their income, while preserving Colombian heritage. These classes and the resulting certification process are also used to ensure the quality of the goods / services provided. This entry was posted in Cartagena Life and tagged A casa del buen marisco, Crochet, Hanging out in Cartagena, traditional Colombian crafts. Bookmark the permalink. I am guessing that is a store dummy, not your friend, Iris next to you in the photo. Kristen, Loved the article as I sew also. Will touch base on how to get these patterns and fabrics.